The Panama City Beach Chamber of Commerce’s celebratory Annual Awards Dinner was truly a night of recognition as it honored six outstanding Beach Chamber members. On Thursday, February 18, 2016, at Edgewater Beach & Golf Resort, the evening was themed “A Gatsby Gala,” a spin-off of F. Scott Fitzgerald’s iconic novel, The Great Gatsby. 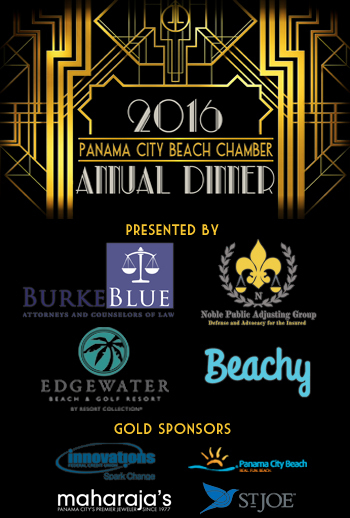 The Beach Chamber would like to give another appreciatory thank you to the Annual Awards Dinner Presenting Sponsors; Noble Public Adjusting Group; Beachy; Burke, Blue, Hutchison, Walters, and Smith P.A; and Edgewater Beach & Golf Resort; and our Gold sponsors, The St. Joe Company; the Panama City Beach Convention & Visitor’s Bureau; Innovations Federal Credit Union; and Maharaja’s Fine Jewelry. This prestigious event recognized local citizens for their dedication and accomplishments in the community and with the Beach Chamber. Doug Gilmore, our Pioneer Award winner, built the Osprey on the Gulf in 1987 and has continued to run both resorts with his family. He has always sought to be a positive impact on his community, serving on the Bay County Chamber of Commerce Board of Directors and Resort Council Board, and the Motel & Restaurant Association Board to name a few. Continuing his commitment to make Panama City Beach a great place to live, Doug was elected to the Panama City Beach City Council in 1998. His 4 years on the Beach City Council prove positive of his pioneering spirit. From 1998 to 2002, the Beach City Council established the Front Beach Road CRA to address traffic issues, expanded recreational facilities at Frank Brown Park, entered into partnership with St. Joe to develop Pier Park, contracted with Bay County to build and help fund the Northwest Transmission Main, and more. Doug continues to serve his community today and was recently appointed to the Panama City Beach Senior Center Advisory Board. The Past Chairman’s Award was given to 2014 Chairman of the Board, Mike Burke, for his leadership of the Beach Chamber. This year’s HYPE (Helping Young Professionals Evolve) Member of the Year is the Director of Business Development at the Resort Collection, Richard Holt. Richard has remarkable leadership skills, dedication to the success of HYPE, and he exhibits a conscious commitment to better the chamber and community. This year’s Jean L. Schaffer Ambassador of the Year, Shannon Richmond, is that and more. Whether it be attending ribbon cuttings, grand openings, or sharing social media posts encouraging businesses to join, she brings a contagious energy to the Ambassador group. She is not only a great asset to the chamber, but also equally valuable to the community with her involvement with Beach Care Services. This year’s President’s Award was given to Paris Janos. The President’s Award is given out to recognize a Beach Chamber member who has made a lasting, positive impression on the chamber, its staff, board, and the business community. This award is not given out every year, but only when the president feels there was an extraordinary action that an individual displayed. Paris has been a dedicated member for 27 years and a true friend to everyone he meets. There is never a dull moment with anything he gets involved with. Whether it’s emceeing the Covenant Mask Gala and Friday at the Beach meetings, or walking for Making Strides Against Breast Cancer, he serves his community in many ways. Rhett Miller, our 2015 Business Excellence Award winner, has lived in this community for just a short 3 years and is already known for his strong work ethic, dedication to client satisfaction, and easy-going demeanor. Rhettâ€™s hands-on leadership style has served his business as well as in community service. In addition to being an ambassador with the PCB Chamber of Commerce, he regularly attends every chamber event and even donates his services to contribute to their promotion. Our Humanitarian of the Year award was given to Lori Allen with the Children’s Advocacy Center. You would be hard-pressed to find another person who puts as much time and effort into serving others, both in her commitment to community and civic organizations as well as utilizing her business to aid in charitable services. With a typical 80 to 90 hour work week, Lori never fails to miss an event, fundraiser, or anything that might help further the cause of child abuse prevention, education or awareness. In a short 5 years, she has taken a very small and limited Children’s Advocacy Center, and has transformed it into the hallmark of Florida CAC’s. There are truly not enough adjectives to sufficiently describe the work she has done for the children in Bay County and surrounding areas. This year’s Chairman’s Award was given to Mayor Gayle Oberst. Having served on the Board of Directors, she has shown outstanding service and contributions to the chamber. Gayle has lived in Panama City Beach since 1991 and was first elected to the Panama City Beaches City Council in 2000. She has served as Vice Mayor and Ward 2 Council representative, as well as serving on the board of over six organizations. What we all know her for, however, is serving as the Mayor of Panama City Beach since 2006. And while she may be terming out in April of this year, we will never forget the amazing impact and commitment she has made to Panama City Beach and Bay County. Again, congratulations to all award winners and thank you to everyone who attended this year’s Annual Awards Dinner.